Luis Trenker directed and starred in this visually stunning WWI action-adventure mountain film epic on skis set against the breathtaking snow peaks of the Austrian Tyrol. 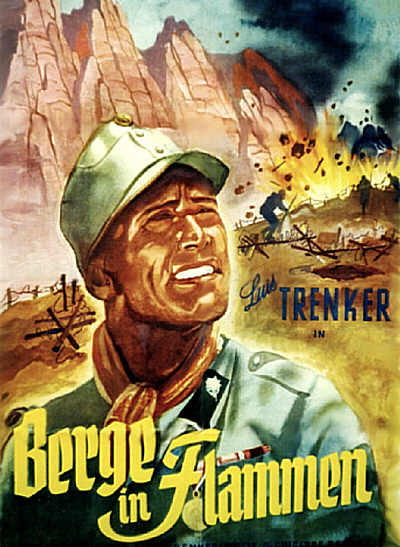 Trenker leads an Austrian battalion that is desperately holding an isolated, inaccessible mountaintop against Italian invaders. When Italian troops dig a tunnel under the mountain to dynamite the emplacement from below, Trenker sets off on a daredevil ski exploit across the snowy terrain in an attempt to determine when the explosion is set to take place. Unbearable suspense mounts as audiences await the fate of the doomed battalion that rushes to evacuate its position before it is obliterated. "Berge in Flammen", a German-French co-production, is the most spectacular mountain picture ever made, simply because of Sepp Allgeier's breathtaking location cinematography shot in the Dolomites. This Disc contain 2 versions of the film: one with optional English subtitles and the other with hardcoded Italian subs.